The academic year in South America follows the calendar year, with classes beginning in February or early March and lasting until late November or December. Because of the strong commercial links between the two American continents, the demand tends to be for North American English. The whole continent is culturally and economically oriented towards the United States and Canada. While some language schools may require teachers with a degree from a university, others are looking for no more than a good command of English (whatever the accent) along with a TEFL certificate. Located at Samara Beach, in Guanacaste, known as the "gold coast". 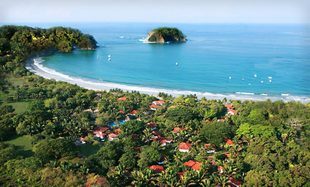 Guanacaste province has lush countryside, beaches and a rich culture making it exceptional region for travel and study. The TEFL school is a quick walk from the beach and offers fully equipped air-conditioned rooms. On the weekends trainees enjoy local surf contests and concerts, bonfires and a variety of delicious international restaurants. Trainees may also snorkel, take surf lessons, swim or boat to Isla Chora, go horseback riding, bike ride and bask in the sun on the white sand shores. This course includes FREE beach yoga and Spanish classes during the 4 weeks! Includes Free Beach yoga and Spanish classes! Guadalajara has one of the most charming and well preserved historic downtown areas in Latin America, where travelers can witness the evolution of the region and entire country thanks to the buildings that adorn the landscape. You will see astonishing architecture of the Catholic Church as well as lavish government palaces that have served as the administrative center for the Spanish Crown in the new world. TEFL Mexico has been accredited by the Secretary of Education of Mexico (SEP) and has been recognized and accepted by thousands of Universities, Colleges, High-Schools and Language Schools all over the world. Additionally, proud members of The American Council on the Teaching of Foreign Languages (ACTFL), The College of Teachers, The International Association of Teachers of English as a Foreign Language (IATEFL), The International Association for Language Learning Technology (IALLT), and The American Chamber of Commerce/Mexico (AMCHAM). The spacious TEFL training center in Buenos Aires offers first-class facilities in a historic part of town. There are two fully equipped classrooms, a comfortable work area for planning lessons and a computer lab with WiFi. You can also enjoy sitting on the patio for coffee breaks and the terrace for the occasional asado (BBQ). The training center is located in San Telmo, (Tucuman 633) one of the most traditional and picturesque neighborhoods in Buenos Aires. Within walking distance are the many restaurants, bars, and cafés that make San Telmo popular with tourists and locals alike. For exploring, there is excellent public transportation in the city including trains, subways, buses, and ferries to Uruguay. IDELT (International Diploma in English Language Teaching) is offered in partnership with Metropolitan State University of Denver. Upon successful completion of the program, students receive a joint certificate from both MSU Denver and BridgeTEFL. The "TEFL experts" in Chile with over 20 years of experience in the country, this TEFL training center in Santiago was founded in 1990 and is now the largest of the South American schools. The center's modern facilities offer fully equipped classrooms, central air-conditioning and heating, plus access to fax, phone, e-mail and the Internet. The training center is conveniently located in Providencia, (Los Leones 439) an upscale neighborhood with tree-lined residential streets, high-rise office buildings, and plenty of shopping and restaurants. It is also only a few blocks from the city's metro system, and a short walk from Suecia, a center for nightlife that hosts some 50 restaurants and nightclubs. IDELT (International Diploma in English Language Teaching) is offered in partnership with Metropolitan State University of Denver. Upon successful completion of the program, students receive a joint certificate from both MSU Denver and BridgeTEFL. In Chile, there is the opportunity to participate in a unique teaching program that connects local children with native English speakers, for a semester or a year. The Chilean Ministry of Education (MINEDUC) and the United Nations Development Program recruits a select number of English teachers (ages 21-35) for the esteemed "English Opens Doors" Program. Since 2005, the program has been extremely successful and continues to expand. Annual application deadlines are in Oct/Nov and program start dates are in March/April and August. As a volunteer teacher with this program, you will have the chance to team-teach classes with Chilean English teachers in public and subsidized schools, helping to motivate students to learn English and create new opportunities for both teachers and students to practice English language skills on a daily basis. You will also organize and implement extracurricular activities such as English conversation groups, art projects, dance classes, and sports and science clubs. TEFL training specific to the volunteer context during a week-long orientation (food and accommodations provided). A volunteer allowance of CLP 65,000 per month to reimburse local transportation or other costs related to teaching. Airport transfers to accommodations upon arrival for volunteers who arrive on designated dates. Assistance registering the visa and obtaining a Chilean I.D. card. In-country support from the National Volunteer Center as well as the Regional English Representative. Year-long volunteers receive a week of paid vacation, in addition to regular holidays. TEFL programs in Buenos Aires and Santiago have been approved by ACCET (Accrediting Council for Continuing Education and Training) and are recommended for credit at over 1,500 universities. These 3 programs have been recommended for six graduate-level semester hours as an elective or as a teaching practicum in Teaching English to Speakers of Other Languages (TESOL).